Remember the first time you saw Twilight and you walked out of the theater in a glittery daze and thought to yourself, man I wonder what's in Harry Clearwater's Fish Fry? Well, I did. Not that we have to make ours homemade around here. We have two awesome seafood breaders readily available in my neck of the woods that are amazeballs... one from House of Autry and one from Adluh. But I've learned writing this blog that you guys don't always have access to the same things I do so I decided I would try to create a recipe for a fish fry that you could make. And just in case the zombie apocalypse knocks out my two favorite mills, I'll have a backup plan for frying fish. I decided against garlic and after sniffing most of my spice cabinet, settled on a pretty basic lineup. I heated the grease, dredged the fish, fried it up and.... fell in love. Serve with a big basket of homemade Hush Puppies for an authentic Southern fish fry experience. Heat a minimum of 4 inches of oil in a deep skillet or wide pan to 350 degrees (medium-high heat). Season fish with salt and pepper. In a medium bowl mix buttermilk and hot sauce. Dip fish, one piece at a time, in buttermilk mixture and shake off all excess liquid. Dredge fish in fish fry and immediately add to hot oil. Cook until golden brown and remove to a plate or pan lined with paper towels. *Use any flaky, white fish (crappy, bream, catfish, tilapia, flounder, etc.). I actually used swai fillets. I had no idea what swai was but it was only a few bucks for a 2-pound package at Aldi so I thought... meh? If you like catfish, you will LOVE swai. I found it to be almost identical to catfish sans the musky taste. Plus is wicked cheap. Holla! **If using self-rising cornmeal, increase amount to 2 cups and omit flour. Now that's what I'm talkin' about! Can't beat Southern style fried fish. The picture is gorgeous! Thanks! Gotta love my professional set-up which consists of turning on every light in my kitchen and grabbing my phone to snap a shot! As long as you never use the flash! I'm with Jackie, that looks fabulous and now I'm starving. And I just finished eating breakfast! Meg is correct. Nevah evah use flash. Keep doing what you're doing. These look awesome. Think I'll need to give them a try! Thanks! Let me know how it turns out if you decide to give it a try! I almost always have a pot of grits with fish (whether it's fried, baked, etc.). I'm so bad about it that I once made fish sticks for the onions and they looked at me and asked, "Where's the grits???" Try some creamed corn mixed with the hot sauce, instead of buttermilk!! Doesnt sound good, but there is a restaurant here in Mississippi that uses it. It is awesome!!!! That is now an important ingredient when frying fish. oh yes, we used to make corn fritters like that.. so good.. I love this sight, am glad I found it..
Well I was looking for a baked fish recipe, but OMG this just looks amazing. Can't wait to make it on Friday!! Lately I've taken to buying swai or basa, because I love the flavor and texture, and because it is so much more affordable than channel catfish, or other American catfish. Because they grow fairly large, they are usually sold as boneless fillets. Both swai and basa are species of pangasius catfish, from southeast Asia. Just like with American catfish, depending on water clarity, the type of river or lake bottom, and the fish's diet, the flavor can range from very mild to slightly muddy or musky. Usually, it's very mildly flavored, though. Recently, I've been using a fish fry that's a seasoned mixture of cornmeal and corn masa flour. The South Your Mouth Fish Fry is closer to what I normally use. It sounds delicious, and I'm eager to try it. Is the texture crunchy? I always cook extra so I can have leftovers with grits the next morning. Nothing better than crunchy fish in grits. When I get catfish, I soak them in milk for about an hour - tastes fresh caught and no muddy musky flavor. I also lightly salt/pepper bare fish before dipping or breading. Just the way my granny did it. Can't wait to try this, maybe this weekend! It's crunchy when you first make it but I doubt it would still be the next morning. I LOVE me some fish and grits!!! I also use peanut oil for frying. THANK YOU ONCE AGAIN FOR ANOTHER AMAZING RECIPE!!! Daughter prepared fried oysters on our week-at-the-beach Gulf vacation. Being a Southern beach-lover for 50 years, these were the MOST FABULOUS fried oysters ever - thanks to your very tasty SYM Fish Fry recipe. Served them as appetizers - hot off the stove. Sherri, I'm SO happy to hear that! Thank you for letting me know! Laurie, GURL! You got me wanting oysters now! That sounds delicious!! 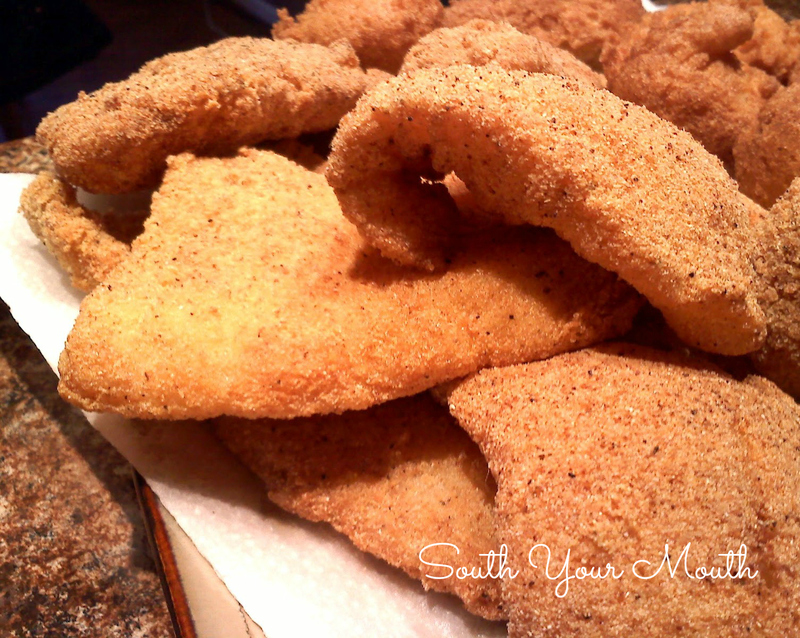 I found this amazing blog wile searching Pinterest for a recipe for Southern Fried Fish. As a Southerner trapped in NY, I can tell you, it's a God send. I'm making this tonight cause it just sounds awesomesauce! Thank you! I had to come back and let you know that I did, indeed make this and your hush puppies for dinner. My husband is a NYer. He doesn't like a lot of fried food and really doesn't like fried fish. He's also not a fan of anything spicy. He not only waxed poetic over this, but asked if we could have it again next week. EPIC home run! Thank you! I'm so glad y'all liked it!!! And thank you so much for letting me know. And for letting me know you're enjoying the blog. You made my day! Could you deep fry this as well? Cut it with a little water and you'll be all set! Okay, I've got so many questions. Fish and buttermilk are not my favorite foods to cook. But I just gotta try this recipe ASAP! The pic of your fish and your fish fry mix have given me the courage. So, here goes. Do you soak your catfish in buttermilk to get rid of the fishy taste? What kinda oil should I use? And should the oil cover the fish while its frying? Thanx for your response. This recipe is awesome! Everyone who came to our fish fry loved it. The only thing I changed was I used a 1/2 cup of Oak Grove fish fry instead of regular flour which added some heat. We Louisianians love the heat. I am going to add this recipe to my homemade mixes Christmas gift basket this year! Thanks so much for sharing! !